In November 2016, I had the pleasure of serving as the Chair of the thirty-third session of the Intergovernmental Working Group of Experts on Standards of Accounting and Reporting (ISAR), the United Nations focal point for issues of accounting and reporting. The session underscored the role of reporting in attaining the Sustainable Development Goals, as well as facilitated the sharing of best practices in monitoring of compliance and enforcement. A highlight was the quality and enthusiasm of speakers, who engaged in fruitful discussions with all participants and truly made the ISAR session a constructive experience. It is my pleasure to open this newsletter, which provides information on ISAR’s most recent events and achievements, as well relevant news briefs from the reporting community. I would also like to use this opportunity to invite the entire ISAR network to engage further in the upcoming session of ISAR, which will take place in Geneva, on 1-3 November 2017. Registration for both the session and the workshop are now open! ISAR will host a one-day technical workshop on recent issues in the practical implementation of IPSAS. Country- level practical implementation experiences and challenges. Further information about the session and the workshop, including a detailed programme and a list of speakers, will be shared with the ISAR network in the coming months. We encourage you to register now and start your travel arrangements early. UNCTAD, through a project funded by the UN Development Account, is inviting ISAR members in Africa to take part in the Regional Workshop on Financial inclusion: Best Policy Practices and Guidelines on Accounting and Insurance regulation for Micro, Small and Medium-sized Enterprises (MSMEs). Access to finance is vastly determined by the capacity of MSMEs to produce basic financial information. While some countries in Africa have adopted IFRS, others are following accounting codes and principles set by national or regional treaties. In this context, the implementation of standards represents a number of challenges for users, preparers, regulators and providers of financial services. The workshop will seek to facilitate the sharing of best practices and guidelines to enable the development of action-oriented strategies in the areas of accounting and insurance for MSMEs, with a view to enhancing their access to finance and insurance services as well as strengthening regional cooperation, particularly towards the attainment of the African Union’s Agenda 2063. Key policy regulators and experts in the area of accounting and insurance have already registered for the event, and interested participants are encouraged to contact Ms. Emma Bergman (emma.bergman@unctad.org) for further information. UNCTAD recently published: Monitoring of Compliance and Enforcement for High-quality Corporate Reporting: Guidance on Good Practices.This guidance document presents developments and good practices that developing countries and countries with economies in transition could consider in designing, developing and operationalizing their national monitoring of compliance and enforcement systems. Among others, the proposed framework builds on existing good practices, benchmarks, core principles and successful case studies to support member-states in this pivotal task.UNCTAD will be undertaking communication and dissemination efforts in the coming months to share the new publication with all interested parties. In October 2016, after participating in the thirty-third session of ISAR, the Government of Colombia submitted an official request to the UNCTAD secretariat in 2016 for technical assistance in implementing the Accounting Development Tool (ADT) in Colombia. The implementation of the ADT in Colombia is an initiative of the Technical Council of Accounting in cooperation with the Faculty of Economic and Administrative Sciences of the Javeriana University. Through the ADT, both entities envision a rigorous assessment on the state of laws, regulations, institutions and practices around corporate reporting, encompassing legal framework, monitoring, compliance, enforcement, human capacity and the capacity-building process in Colombia regarding international standards. Additionally, this initiative is considered a valuable opportunity to bring together key institutional stakeholders of the highest level, and to draw their attention towards the current state of the infrastructure for corporate reporting. 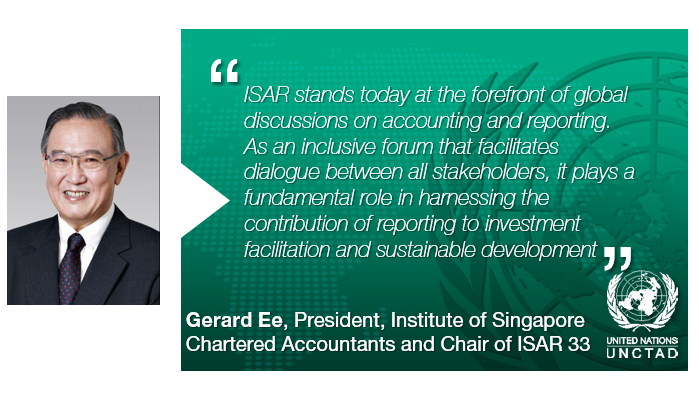 A report on the process and lessons learned will be shared during the thirty-fourth session of ISAR. To learn more about the ADT, please click here. UNCTAD is constantly working on extending its outreach to government officials, professional bodies, international organizations, private sector and other experts involved in the area of accounting and reporting. To this end, UNCTAD relies on you to keep us abreast of any updates to your contact information. If you are not already part of the ISAR network and would like to join for updates on ISAR’s meetings, events and activities please complete this on-line ISAR Network form. United Nations Member States are also encouraged to apply for formal membership in the ISAR Group of Experts. Additional information about requirements and the application process can be found here. In early 2017, UNCTAD welcomed the new or renewed membership of Côte d’Ivoire, Germany and the Russian Federation. On 18 May 2017, the International Accounting Standards Board (IASB) revealed in a press release the new International Financial Reporting Standards (IFRS) 17 Insurance Contracts, which will replace IFRS 4. IFRS 17 provides greater visibility about the risk exposure of the insurance industry by requiring “all insurance contracts to be accounted for in a consistent manner, benefiting both investors and insurance companies.” The standard has an effective date of 1 January 2021. On 3 May 2017, the IFRS Foundation published the new edition of its Pocket Guide to IFRS Standards: the global financial reporting language. The report includes an assessment of IFRS use in over 150 jurisdictions, according to which “126 (jurisdictions) require IFRS standards for all or most domestic listed companies and financial institutions.” Further information on the press release can be accessed by clicking here, and a sample of the full report is available on this link. On 25 May 2017, the International Federation of Accountants (IFAC) issued a report about tackling challenges in the accounting profession, Developing a future-ready profession. Relevant challenges include the stakes of emerging technologies, the new role and skills of accountants in a fast-changing environment, the role of the media in accounting communication, and the place of integrated reporting in corporate value creation. Click here for the press release and here for a more detailed presentation about the report. This year’s UN/INTOSAI Symposium – a three-day capacity building conference organized every two years in Vienna by the United Nations Department of Economic and Social Affairs (DESA) and the International Organization of Supreme Audit Institutions (INTOSAI) – focused on the latest trends of digitalization, open data and data mining and their implication for the audit work of supreme audit institutions (SAIs). It also considered “the possibilities of SAIs to contribute to the implementation of the 2030 Agenda and the UN Sustainable Development Goals.” This interactive meeting, which gathered 150 participants, offered an opportunity to share knowledge and best practices in a constantly evolving field. The International Integrated Reporting Council (IIRC) joined forces with the Global Reporting Initiative (GRI) to organize a two-day conference during 18-19 April 2017 in Amsterdam. This partnership aims at bringing integrated and sustainability reporting at the core of corporate practices in the 21st century. The event was focused on improving reporting mechanisms by means of integrated thinking and appropriate disclosure designed for investors, and drew on the engagement of businesses as part of the GRI/IIRC Corporate Leadership Group. You can have access here to a video with exchanges between Richard Howitt, CEO of IIRC and Tim Mohin, GRI’s Chief Executive. On 7 June 2017, GRI hosted its annual governmental donor meeting bringing together GRI staff from Africa, South America and Asia and funding partners including Australia, Switzerland and the United Kingdom. Among others, the gathering stressed that limited involvement of developing countries’ Small and Medium Enterprises (SMEs) with sustainability reporting could undermine their competitive advantage in global value chains; that advancing a standardized and multidimensional tool for corporate reporting is an important step towards a clear assessment of private sector performance in attaining the SDGs; and that the data arising from sustainability disclosures should be extensively used by comparing results across industries and regions. More details about the event are available here. In February 2017, the London Stock Exchange Group (LSEG) released a new guideline for good Environmental, Social and Governance (ESG) practices, as investors and stakeholders push for sounder and more transparent ESG reporting. The guide draws on the Financial Stability Board’s Task Force for Climate-related Financial Disclosures (TCFD) recommendations and the SDGs. By sending the guide to “more than 2,700 companies that have securities listed on LSEG’s UK and Italian markets”, LSEG wants to facilitate ESG reporting for investors and to promote the business case for non-financial reporting by highlighting best practice examples. Further information on the press release can be accessed by clicking here. On 23 May 2017, the Sustainability Accounting Standards Board (SASB) commissioned a “rigorous, independent analysis” discussing the economic impact of a market-wide adoption of the SASB sustainability standards by United States listed companies. The report discusses the implications of the standards on capital markets, including with regard to “firm value, cost of capital, market liquidity, and information asymmetry between firms and investors.” It also presents key implementation issues for companies that seek to standardize sustainability information for themselves and investors. The International Corporate Governance Network (ICGN) will hold its annual conference during 11-13 July 2017 in Kuala Lumpur. The event is jointly organized with the Minority Shareholder Watchdog Group (MSWG) and will gather investors and enterprises to discuss the challenges of achieving a sustainable global economy; the visibility of corporate social responsibility (CSR) schemes in a context of heterogeneity in initiatives; and the necessity of mainstreaming ESG issues into contemporary corporate practices. Additional information can be found by clicking here.